But anyway, happy braiding! This is the easiest hairstyle ever, and looks good on just about anyone. A few tips: I think the key to nice, thick looking braids in any style is to loosen them up as demonstrated in the video. Also, at the end, don't be concerned if hair is sticking up or out- tuck and pin is my motto! Don't be afraid to use bobby pins. A messier look is better with this hairstyle, so perfection is not what you are aiming for. You don't have to have a perfect part or symmetrical braids. And one last thing- dirty hair works best! My favorite kind of hair. haha. Enjoy! *song is "Sweepstakes Prize" by Mirah. Ha! I giggled at your eyebrow raising, kinda like a mime. Loved it. And you as always. @Jess Y. I felt like SUCH a mime! hahah. I felt too awkward talking. Maybe I have a new career coming my way? Ok, so I think Logan has a crush on you! Then when it was over and all your vimeo videos came up he said, "I want to do the baby one!" too cute. I love how your personality comes through in the video even w/o any words!! Your hair looks great like this! I love it. lol i like when you messed up and made that cute little face. so sweet! the braids look darling on you. i might have to try this soon. Super pretty!! Really suits you. that was awesome! cute song too! the look really suites you. holy cow that was adorable! Very cute! I wish my hair was even that long long lol. i don't even have long hair and i just sat through this video because you're so dang cute! OH MY GAH! you are seriously the cutest,ever! thank you so much for doing a tutorial, i can't wait to try this! You are too cute, little lady! Funny, I also had Heidi braids today. It's my favorite hairdo for a bad hair day! adorable video! i will have to try this. i'm a new momma so i have the dirty hair for sure and a bun is getting old! Soooo cute! I love the part where you messed up the braid and redid it, haha. Precious. Thanks for posting this! I can't wait to try it - got my hair majorly highlighted today so I think it'll be great with all the new colors! that was really cute. <3 and i'm definitely gonna try it out myself. sooo cute! and i love mirah. and you. i am following you now :) your hair is awesome. have a great day! I watched this last night & did it this morning for work & school :) I am the world's worst braider but I think it works! I love your facial expressions in this video, so funny! too bad my hair is too short to do this. i would love to see how the back of your hair look in this hairstyle. Oh I just love that hairstyle. I am going to try it soon! Your video was adorable. Thanks for posting the tutorial! I love this. i am running home to try it after work! Thanks. You're adorable in your milkmaid braids! I am just waiting for my hair to grow so I can try it out :) thanks for sharing! Cute, cute video! I loved when you messed up on the first braid & had to start over because right at that moment, I was thinking, "I don't think I could do this without screwing up." Haha. I'm pretty sure you & I have almost the exact same hair (length, color, bangs, etc. ), and I will def be trying this! Thanks for the tutorial! This is great! My sister has long hair AND a three month old. She was just talking about cutting her hair off, as it's starting to become a hazard, but I'm going to encourage her to just rock this hairstyle instead. Thanks for sharing! P.S. Just discovered your blog and love it. It looks super cute on you! This used to be my favorite hairstyle, but now my hair is just way too long to wear it anymore! Love Mirah and love this cute silent video. I would probably fill it with lots of unnecessary awkward chatter. I love your smile, so beautiful! You are so cute! Thanks for sharing. I'll have to give this one a try later. you are so adorable! love it- thanks for the video! Too cute! Love it! Thanks for sharing! This makes me want to grow my hair out pretty lady. That little wave at the beginning is so, so sweet. You are just adorable. Thank you! Super adorable! I can't wait until my hair is long enough to do this! Love this, I have been trying to think of new ways to do my hair. :] Thank you.. This is too cute! Now if my hair would hurry up and grow so that I could do it too. Adorable. As soon as I saw your post on Bluebird Vintage with those braids I knew I needed to try them out! paisley just watched this with me, and said, "oh! where's her other eye?" and "she's sooo cute braiding her hair!" Thank you so much for this tutorial, I'm going to try it out today! Thank you so much for the video. I LOVE this look, but did not know how to do it. I tried it and decided my hair needs to be a little longer and maybe a few less layers, but I am going to keep trying. I love your hair - keep stylin' and sharin'. 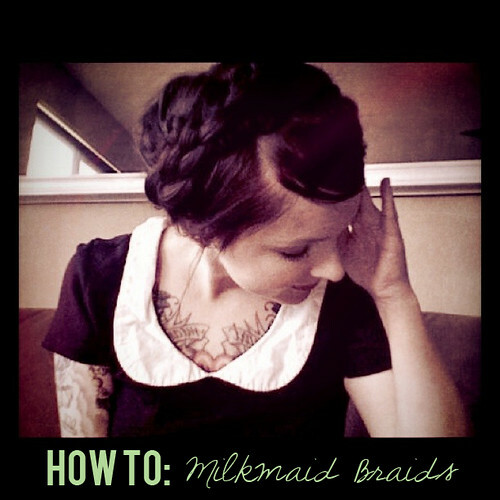 I absolutely love your milkmaid photo, but the video is listed as private. Would you consider altering the privacy settings? Please? i like hairstyles i want to say that i can serme whole life to the hairstyles i can easily do this i like it.hairstyles are a primitive hairstyles one and often linked with the popular and demanding styles in 60s and 70s both in men and women. A parallel hairstyles approach is still followed for girls and women in modern hairstyles amazing hairstyle with a little untidy that curly hairstyles confers a rock & roll look to your hair. This curly hairstyles. style has gone through slight changes over the time. Unlikely to older styles. Horrible song, I had to turn the video off because it was so distracting. Ugh.